Perfume: Chloé Eau de Parfum. Denim: Frame. Sweater: ASOS. Jacket: Carven. Shoes: M. Gemi. Bike: Mosi. Sunglasses: Prada. Nails: Nails Inc. Thank you to Chloé Fragrances for partnering on this post. i love the ring, brand? I can't get over how much I love this post. Your bike is adorable! I have a cream colored bike from Public, but when it's time to retire her, I'm going to have to look into Mozie. ps. adorable jacket! This is adorable!! I'm loving the blush with denim for Fall! Super cute and girly outfit! I'm in love with your coat! A sort of "pink obsession", isn't it?! You look absolutely lovely! I love the fullness of the coat with the sleek jean and shoe! And pastel pink looks wonderful on you! These photos are beautiful! You look lovely! Have a nice weekend! Love these pictures, and lovely pink! I love these photos! That coat looks so comfy! Also love Chloe's perfume, it had such a distinct smell! The photos are so beautiful that I looked at them several times. 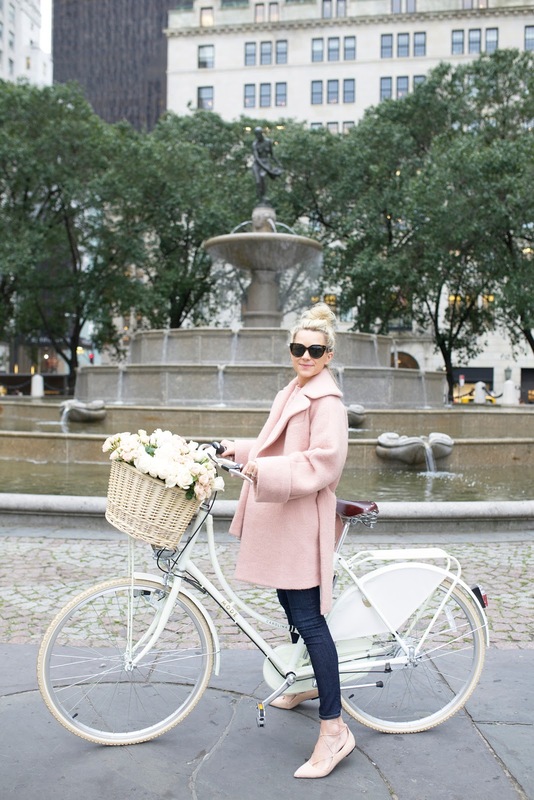 That shade of pink is captivating, and the basket of roses, scenery, and bicycle….just lovely. love these photos with Chloe! I love these pics. The bike and flowers are so fun. Also, your jacket is so chic. In love with those pics, the look is simply perfect! 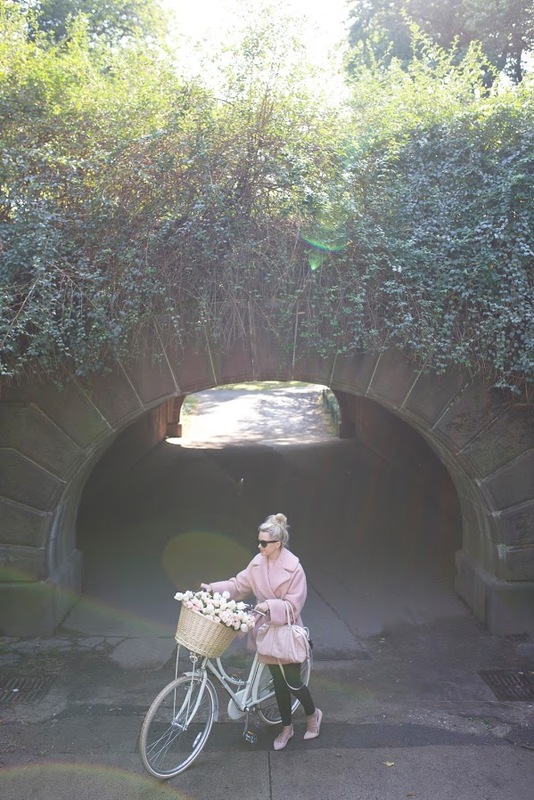 LOVE the style of the pics, the blush pink coat, the beautiful basket of flowers…everything about this post! What a fun casual look for you! I love the coat and the sweater! I love this shade of pink on you! This coat and sweater combo is too good. 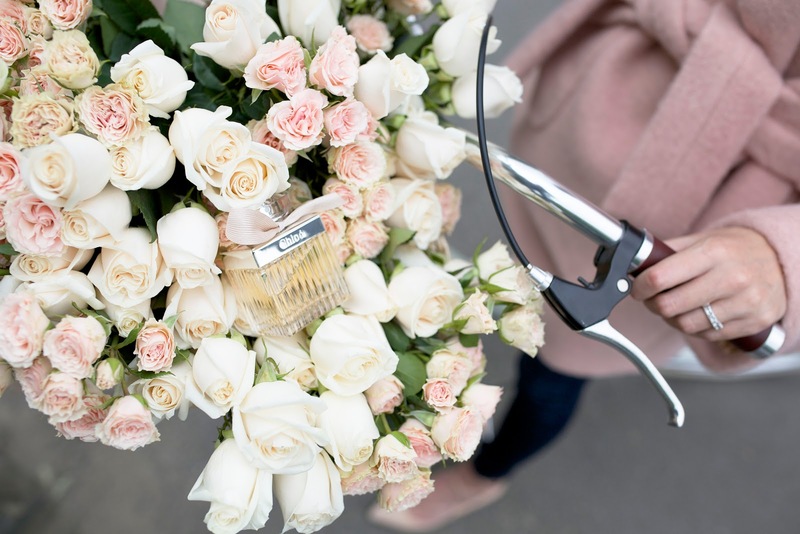 What a beautiful look and a basket full of rose- perfect! Beautiful photos and BEAUTIFUL outfit. Love the pale pink 🙂 And your shoes are sooo cute! Beautiful pastel pink explosion broken up with the cool skinny jeans! Luv your bike and the bag is pretty too. You remind me to return to Central Park in the Fall, so nice! Your shoes and coat are so beautiful. Beautiful bag! Which brand is it? Love your hair and sunglasses! Serious perfection! Love that pink coat. This pink coat is just wonderful! So great to bring some freshness and lightness into the gloomy autumn weather! This such a lovely post! I adore that coat and the entire vibe of your look, so feminine and I love the bouquet of flowers and bike, such lovely props! I've smelt the Chloé perfume and it smells so beautiful, I just need to hold off before I get my hands on it because I have way too many perfumes at the moment, lol! I love how the outfit matches the flower basket! So pretty! Love the pink coat and the nail polish! Just a breath of gorgeous fresh you are! LOVE the sweater and coat. They are such a pretty color. That's the bridge in central park I got trapped under in the rain and it started to flood! 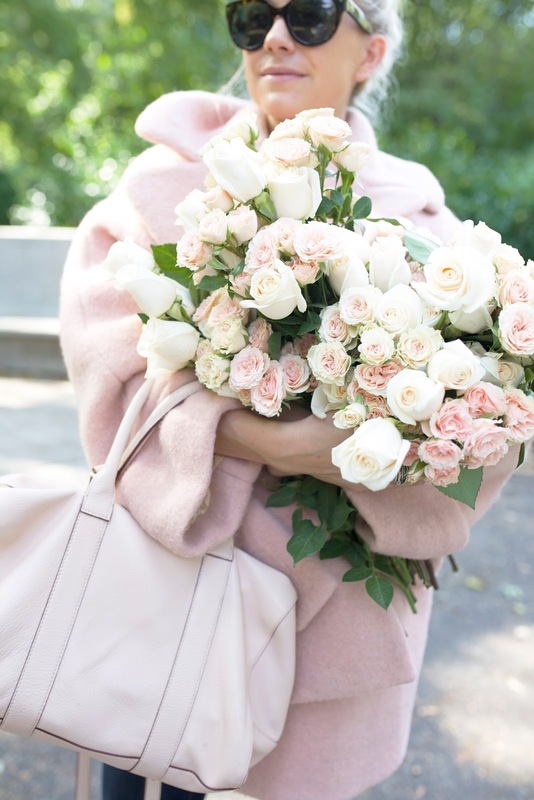 I love those flowers and that coat! Beautiful Pictures, Blair! Yoy really represented the Chloe brand well! I love the pictures and what you're wearing! Gorgeous! I love Chloe perfume. Wow, I love that basket full of flowers and the soft pinks. I have a similar bike in mint green though, I love it so much! In love with those pics and with your pink coat, the look is simply perfect! 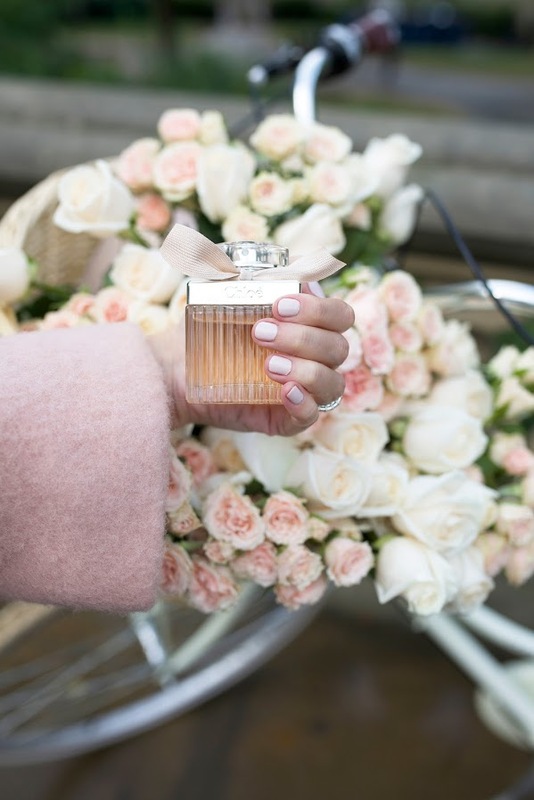 The colour combination in this post is beautiful, so much pale pink that has me absolutely swooning – that's with the Chloé fragrance! What a nice outfit! I love the pink coat and flats! Such a romantic look. Love it. wow, the post is so sweet, and i really like the outfit!!! This look is amazing! I love all things blush pink. Beautiful! So pretty and so comfortable looking! The coat is gorgeous! And it's such an elegant shade of pink. I love how you paired it with pale pink flats. The whole look is comfy but yet so stylish! omg! i looooove this coat! Beautiful look! Would be perfect for transitioning into spring! Omg that coat is stunning! You look great!